We all love and indulge in cakes and bakes. But what if we could feast on them knowing that they are packed with nutrients and are free of preservatives and allergens? Your kids will eat to their hearts’ content and the parents can heave a sigh of relief too. Ovenderful is one of the most popular home bakers in Bangalore. They specialize in healthy and special diet cakes and bakes from alternative flours and natural sweeteners, including vegan, gluten free, lactation friendly, diabetic friendly and paleo. Apart from their regular cakes, their tea cakes, tarts, quiches, muffins, loaf cakes, scones and cupcakes are scrumptious and free of artificial colors or preservatives. A home baker who makes delicious vegan cakes, cookies and other bakes, Smitha Hemadri’s creations are to pine for! Whole wheat, preservative-free, allergen-free, dairy-free, jaggery-free, sugar-free, oil-free and egg-free options are available, all organic and extremely delicious! The Happy Baker provides whole grain, eggless, preservative-free, hand baked, organic and gluten-free cakes. All their bakes can be customized based on requirements. For moms and dads: Their spiced masala chai tea cake and organic cookies! Carrots is a beautiful vegan restaurant in Koramangala and offers a unique range of plant based food, taking inspirations from cuisines from around the world. They have cakes, desserts and other bakes that are gluten and dairy free, using alternatives like almond, cashew and peanut milk to enrich the taste. Located at Lavelle Road, the Gluten Free Bread Botique makes gluten-free, dairy-free and soy-free non GMO breads, cakes, cookies,pizza crust and more, apart from customising cakes and bakes as per dietary preferences. 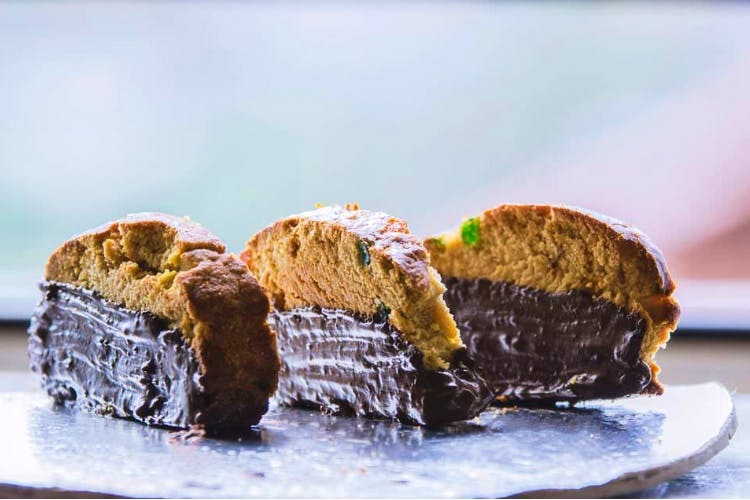 They make all their cakes using sorghum, millet, water chestnut, bean, honey and fruit pulp, and other natural ingredients to create wonderful, rich flavors. Ashel’s Baking Heaven uses local, sustainable and organic products. They make sugar-free, dairy free and gluten free foods. You can also avail of cakes and bakes customized to suit Paleo and keto diets. One of the most popular organic bakers in town, Taantra specialises in organic, multigrain, gluten-free and vegan cakes and bakes. From chocolate hazelnut butter and healthy breads with nuts and seeds to ceremonial cakes and multi grain cakes, there’s something for every kind of health-conscious dessert lover here! True to its name, Fitbakes is a healthy bakery that makes many vegan desserts like muffins, protein cakes and more. A look at their menu will have you rushing to place an order! High in protein and low in fat, these are guilt-free indulgences for the entire family! Lluvia Bakery bakes fresh and preservative free, organic cakes and bakes. All products are made with whole wheat bread so this means that the childlren are getting more whole grains in their diet. All their breads are made with 100 organic ingredients. biscotti and cookies, snacks, partyboxes and mini desserts and sweets. organic whole wheat and baked fresh every day. Kids will love: Their snackboxes, which typically contain a combination of desserts like a muffin and a brownie and snacks like bruchetta and pizza. For the moms and dads: Their cookies, biscottis and tea cakes. Homemade Beku offers vegan cakes. Eggless, dairy free and without any animal products, the cakes are also cholestrol free and are made using whole wheat and organic ingredients. Gluten-free, sugar-free and oil-free cakes are available on request. Place your order two days in advance. *Disclaimer: BuzzingBubs does help with placing orders, contacting the sellers or other such requirements. We are not personally affiliated with any of the bakers. Please reach out to the bakers and restaurants for details on delivery, orders and more.